The Corona range has a rustic distressed pine finish that will brighten up any home. The piece, fitted with 2 doors and 2 drawers, has plenty of storage space for your belongings, providing the ultimate balance between functionality and elegance. The Corona range has a rustic distresses pine finish that will brighten up any home. The piece, fitted with 2 doors and 5 drawers, has plenty of storage space for your belongings, providing the ultimate balance between functionality and elegance. This dining set presents a great rustic feel and simple design. 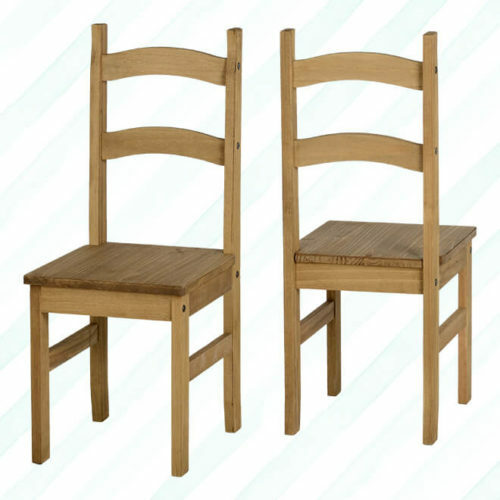 The dining set is skilfully crafted from pine, a popular timber that finishes well and gives a superior build quality. The sturdy and stylish chairs match the table exceptionally well. High gloss finish with 2 doors, 3 drawers and under-shelf with chrome framework. Available Black or White. A touch of rustic quality, the Corona presents a waxed wood finish and ornate black detailing to add an air of elegance to any living room. Constructed from solid pine, the unit features contrasting black handles for drawers which can be utilised as storage units underneath your flat screen TV.